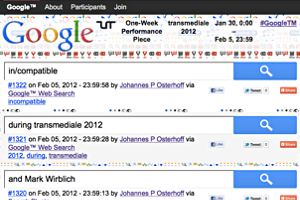 Since the One-Year Piece was already over during transmediale 2k+12, a collaborative one-week edition ducumented participants’ searches during the festival. The one-week performance was accompanied by a workshop during which participants set up their browsers to automatically publish all their Google searches during transmediale on the web. By means of a modified WordPress blog, we interlinked our searches so that our searches received good rankings and become visible in everybody’s search results. The piece is called “Google” and documents all searches we perform with the search engine of the same name. The performance was open to everyone. All those interested could request an account by mail. P.S. In the second part of the Workshop, participants came up with the idea to tell the story of the fictional “Google Storyteller” via their searches. These searches can be found here.